"From the waters shall come all life"
The design of this pendant was inspired by the book “Dune” by Frank Herbert. 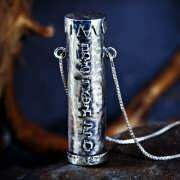 The meaning of the Hebrew words written on the pendant is “from the waters shall rise all life”. The design of this pendant is inspired by the water jewelry worn by native people of the desert planet Arrakis. The pendant is a small vessel sealed with water. Herbert added an ecological theme to all of his books describing the ecosystem and the universe as a living entity with a purpose. 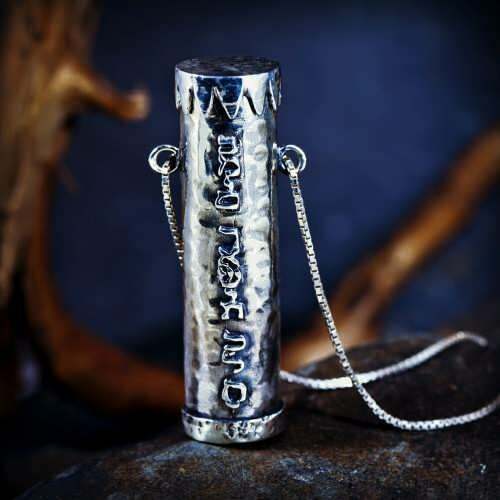 Many cultures believe in the healing powers of water.You the wearer can use the pendant according to your own beliefs and connect in your prayers or meditations to "the source of life" and "charge" it with your own wishes or purposes for yourself or for your loved ones. The hero of the book, Paul Muad’dib serves as an example of a new kind of human being who is transformed and unites his consciousness with the greater cosmic purpose. This transformation is achieved when the hero drinks the “Water of life”. The author describes the hero as the “Qwitzat Haderach" a man who is able to look beyond the masculine and feminine limitations/aspects of creation, to seek unity with the "One" and to look beyond the process of creation itself to within the great void. The award-winning novel Dune, which became the bestseller Sci-Fi novel of all time was written in 1965 by Frank Herbert. It set in the distant future, where humanity lives among the stars as a feudal society, with noble houses controlling different planets, under the rulership of an emperor. The protagonist of the story is Paul Atreides, whose family house becomes in charge of the planet Arrakis (derived from the Arabic word Al Rakisa - The Dancer due to its celestial pattern). This is one example of how Herbert was able to weave endless details that make this fictional world a real one in the mind of the reader. In this novel (and the next ones in the Dune series), Herbert tried to figure out what is the true purpose of the Cosmos, and though many readers read the story as a sort of a thrilling Sci-Fi novel it is much more than that. Herbert created a multi-layered plot with sub contexts tying together politics, religion, ecology, technology, human psyche, and philosophy. In order to emphasize his drive to understand the purpose of the cosmos, he used the metaphor of the “Spice Melange”, the most precious substance in the universe, that exists only on the desert planet Arrakis and enable the one who consumes it to expand his consciousness and literally sees the future. That is the reason that the control of Arrakis is a coveted and dangerous as the forces of the empire confront each other in a struggle for the control of Arrakis and its "spice".